Following Israel’s expulsion of an international observer force from the volatile city of Chevron, Palestinian activists are trying to fill the void by launching their own patrols to document alleged Israeli violence. Armed with video cameras and donning blue vests, the activists say they will replace the Temporary International Presence (TIP) in Chevron. The group has enlisted 18 volunteers and began its work this week. Until recently, the TIP mission stationed unarmed civilian observers from Norway, Italy, Sweden, Switzerland and Turkey to report on alleged violations of international humanitarian and human rights laws in the divided city. TIPH had drawn negative press in Israel in recent years after one of its observers was deported by Israel after slapping an Israeli child and another was filmed puncturing the tires of an Israeli resident’s vehicle. Amro, the activist leader, is well-known in Chevron. Saying he promotes non-violent opposition to discriminatory Israeli policies, he has run afoul of both Israeli and Palestinian authorities. He is on trial before an Israeli military on accusations of inciting violence. In 2017, he was arrested by Palestinian authorities for a posting critical of Palestinian Authority President Mahmoud Abbas. Amro and other volunteer activists began their work on Sunday by escorting Palestinian students to school in the Israeli-controlled downtown area. Tensions started right away, Amro said. An AP cameraman filmed a settler cursing the activists in front of the Israeli soldiers as “dogs and sons of dogs.” An activist cursed him back. Amro claimed he was “slapped and punched by the settlers” and vowed to file a complaint with Israeli police. Yishai Fleisher, a settler spokesman, said the Jewish community is “fully against violence and vigilantism” and doesn’t condone its members’ altercation with Amro and the other volunteers. At the same time, he accused Amro of being an “instigator,” and the main source of tension between Jews and Arabs in the city. 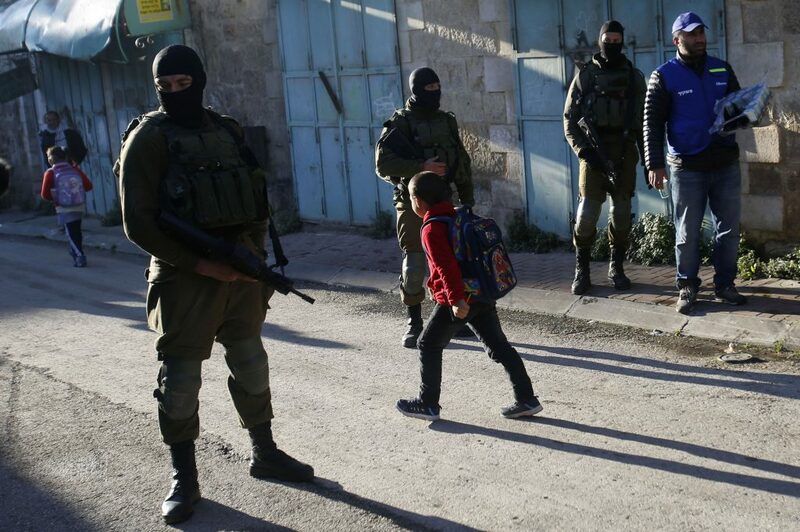 In response to the arrival of the activists, the Israeli military declared the area of the Old City a military closed zone on Tuesday and banned the activists from remaining there.